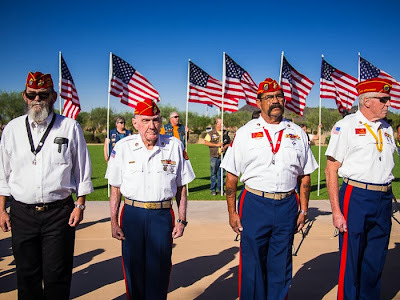 Members of a VFW Honor Guard await the remains of unclaimed veterans during a mass interment of the remains of veterans at the Phoenix National Memorial Cemetery Tuesday. 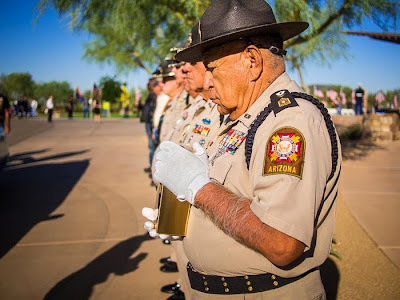 There were 36 funerals at the National Cemetery in Phoenix Tuesday. The cremated remains of 36 veterans were given a military send off. The Missing In America Project organized the mass interment. The remains had been cared for by Messinger's Mortuary in Scottsdale. A few hundred people, mostly veterans, attended the service and stood a silent vigil as the names of the deceased were read aloud. Vets stand at attention as the names of the deceased are read aloud. I went out to the cemetery to photograph the service. It was a perfect day for a memorial. A cloudless, crisp (by Arizona standards) morning and a moving service. There are more photos from the internment in my archive or available from ZUMA Press.